I am sharing two cards with you using Pinkfresh Studio goodies! You can watch it below or on YouTube. 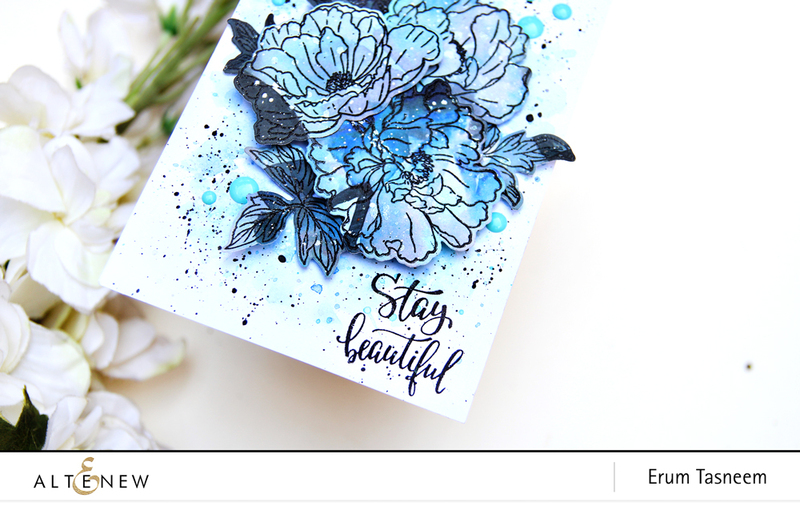 I have one card to share with you today and a process video! 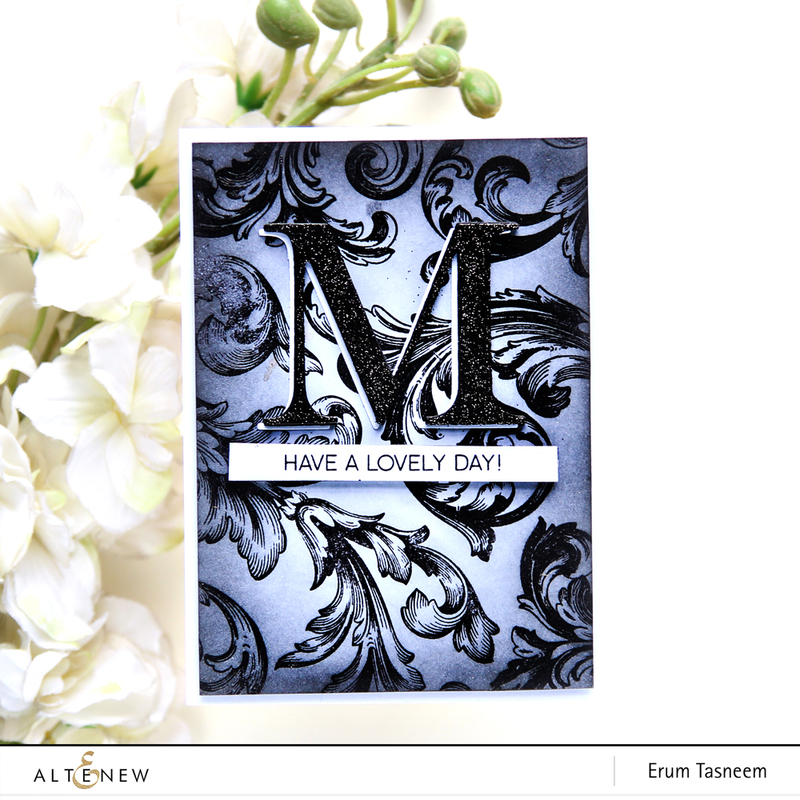 Love the papers in the Live Your Dreams Scrapbook Collection by Altenew and thoroughly enjoyed making this card. 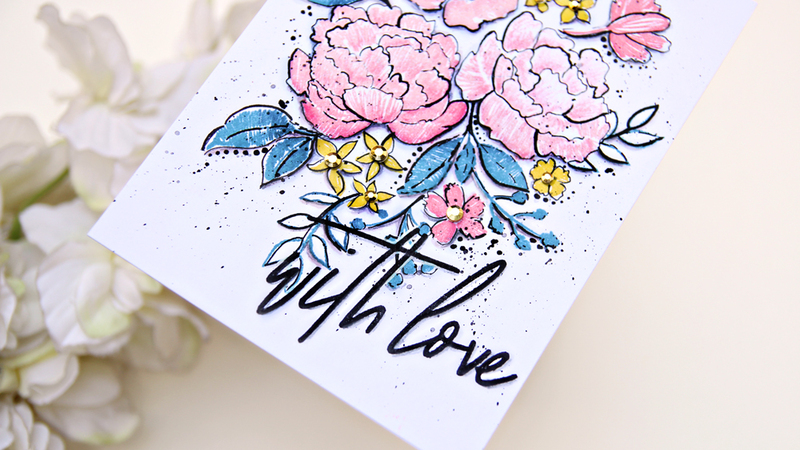 I have used the Beautiful Peony Stamp Set on my card today. You can watch the video to see how easy it was to make this card. To celebrate this release, Altenew is giving away a $50 gift certificate to 6 lucky winners! 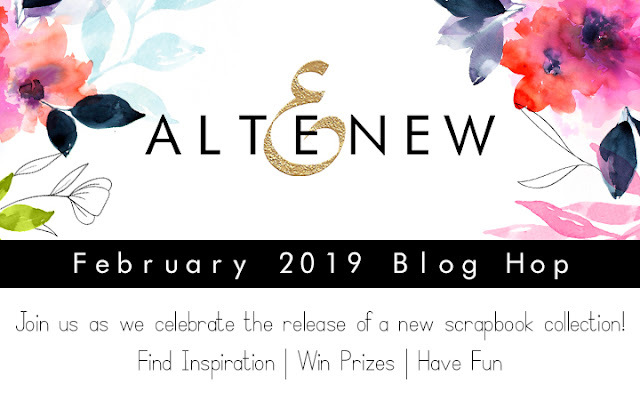 Please leave a comment on the Altenew Card Blog and/or Altenew Scrapbook Blog by 2/28/2019 for a chance to win. 6 winners will be announced on the Altenew blogs on 3/3/2019. 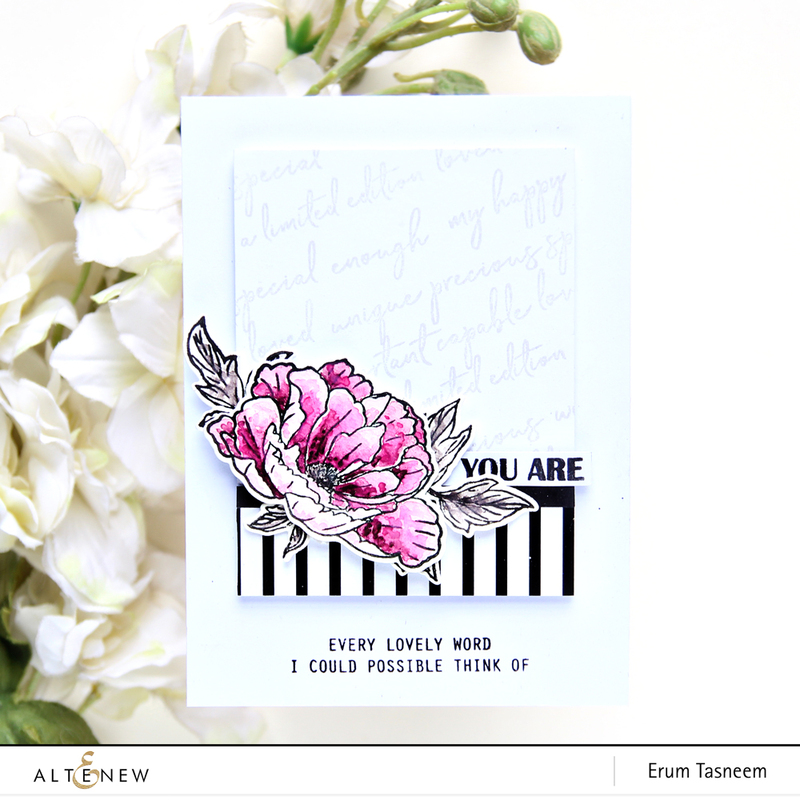 I am here to announce the winner of $30 gift certificate to the Altenew Store for the February Stamp/Die/Stencil Release. Please email winner@altenew.com by 2/28. You must be here from Keeway Tsao blog. 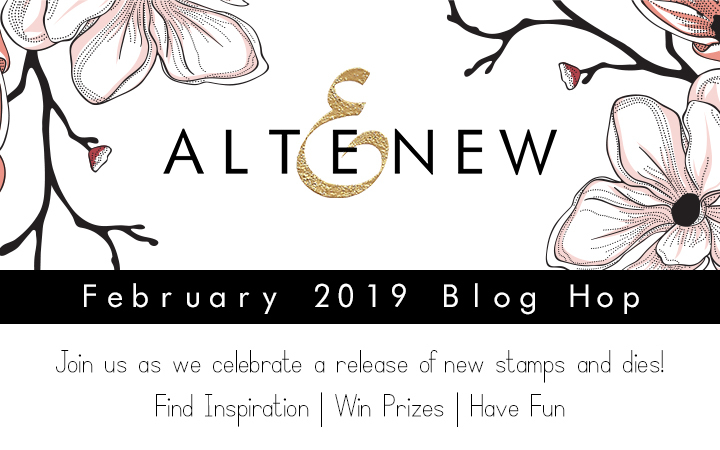 Welcome to Altenew's February Release. I have four very simple cards to share with you. 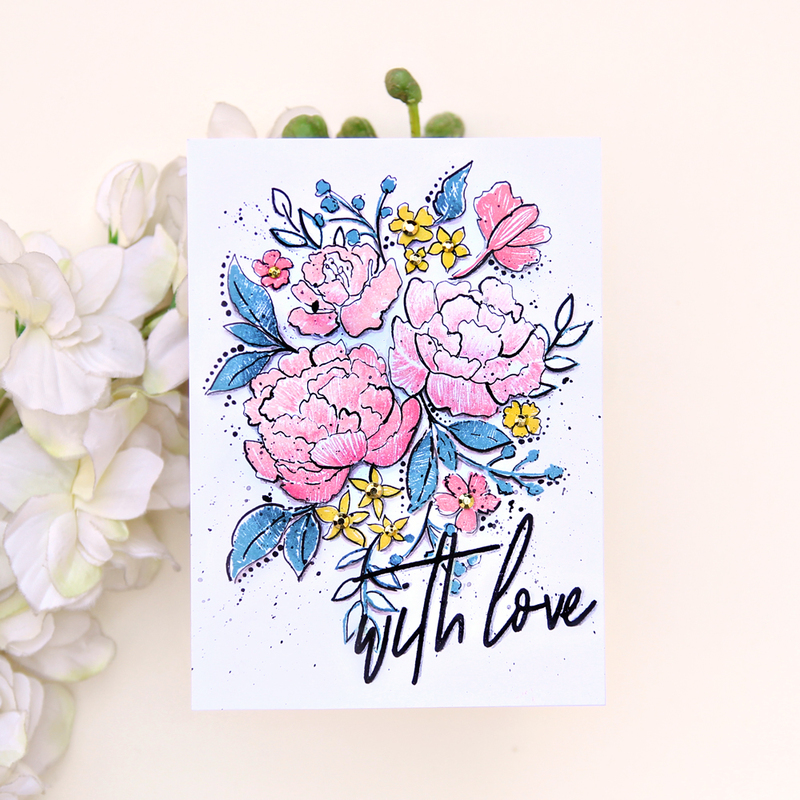 My first card features the Beautiful Peony Stamp Set. 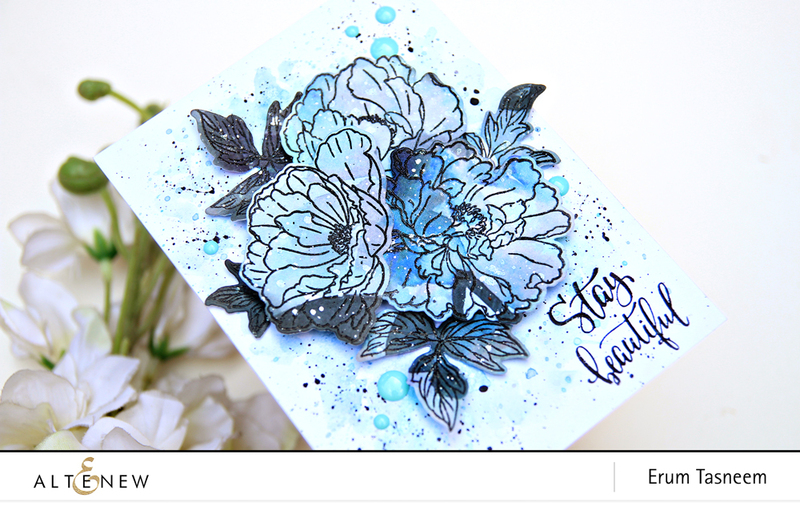 I watercoloured the flower with 36 Pan Watercolour Set and die cut the image with coordinating dies. 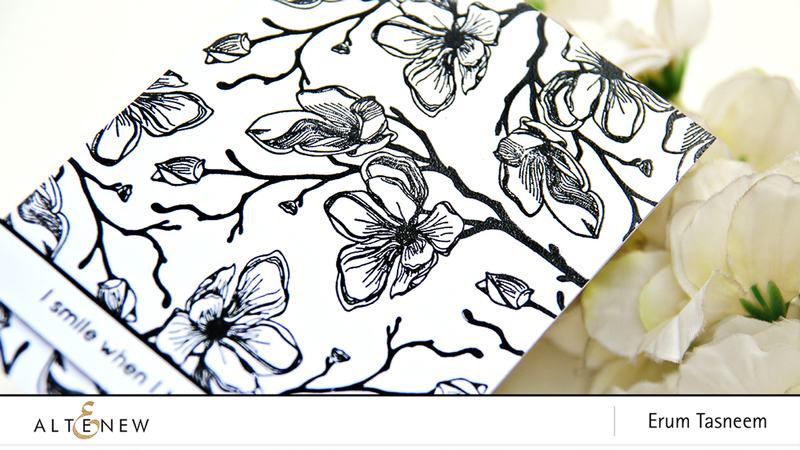 I also added a bit of pattern paper from the Black and White Essentials Paper Pack. 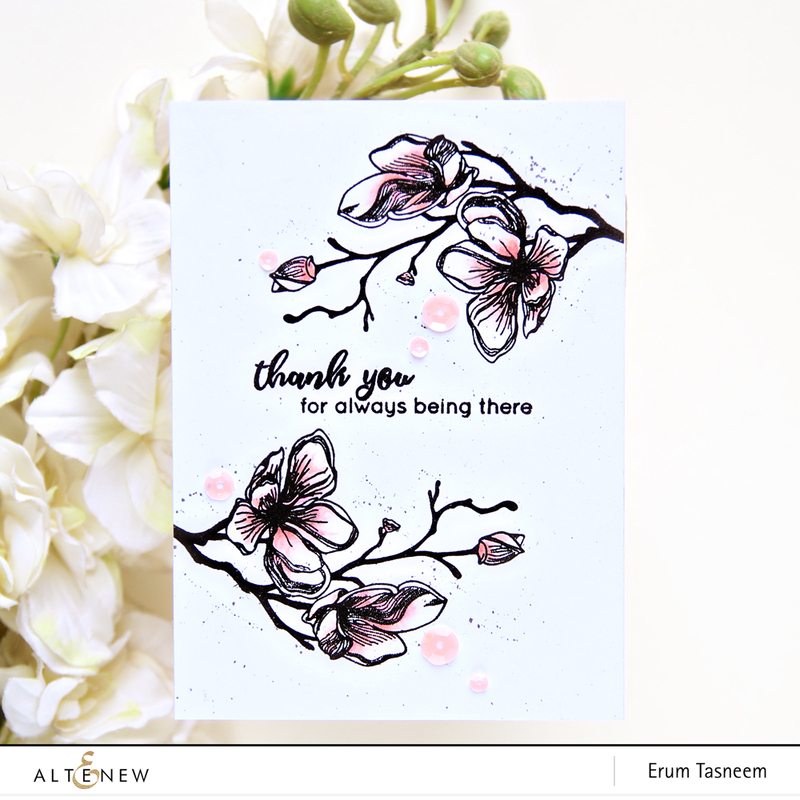 When I saw this Dotted Blooms Stamp Set, I wanted to use it as is and make a black and white card. Just simple, classic background building. Added a strip of cardstock with a sentiment. All images are heat embossed with Crystal Clear embossing powder so that they appear super crisp and bold. 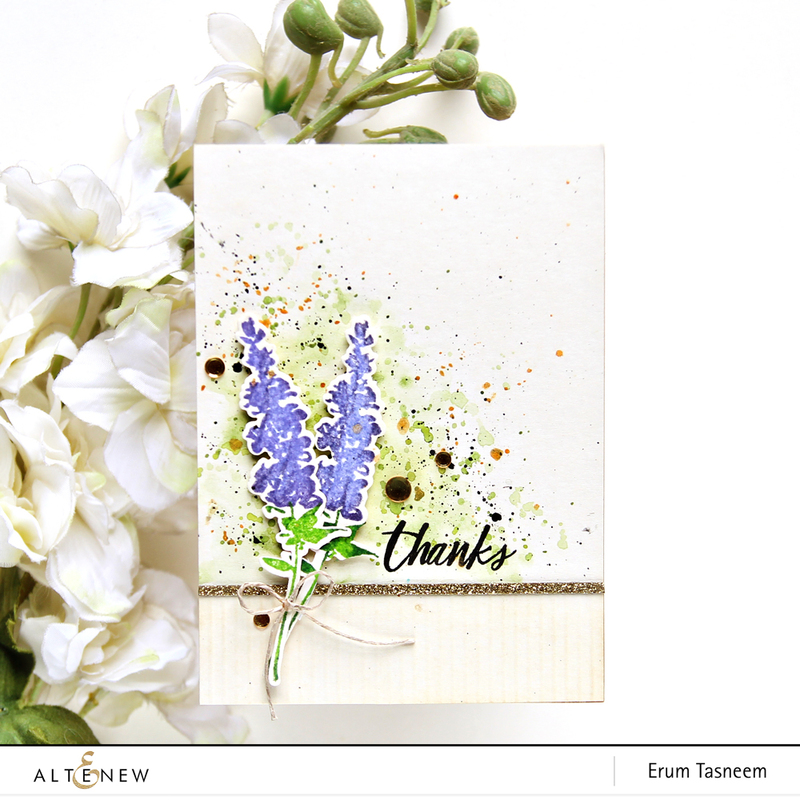 Here is another sample using the Dotted Blooms Stamp Set. Again, I stamped the images with Versafine and heat embossed them using Crystal Clear Embossing Powder. 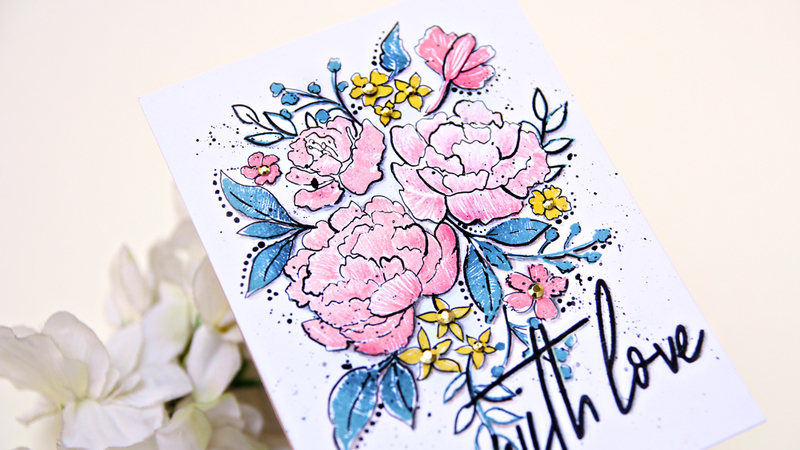 Next, I used Frosty Pink and Coral Berry Artist Markers to add a little bit of colour to the flowers. To add a little interest, I added fine black paint splatters. 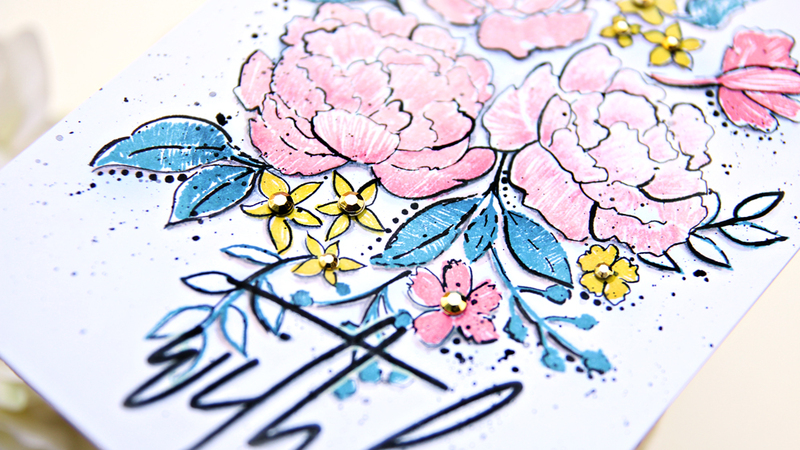 This gorgeous stamp set is called Baroque Motifs. 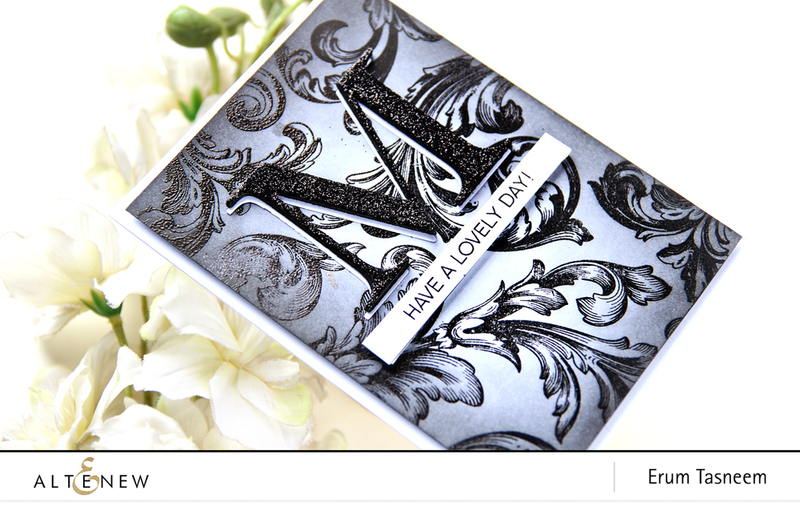 I started by stamping this with Versafine Onyx Black and clear embossed it. Then I inked the panel using Black Soot Distress Ink. I popped up an "M" from Classic Alphabet Die Set. I applied black glitter to this and added a white offset to make it stand out. 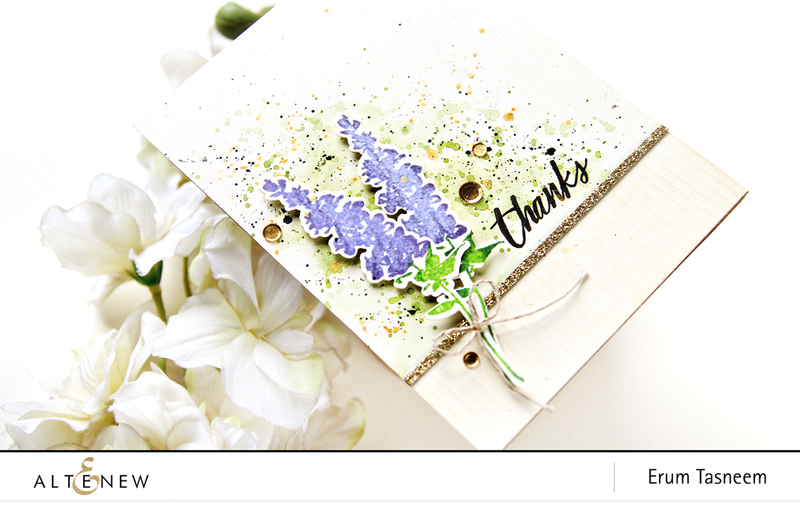 For this card, I used the Lavender Bud Stamp Set. I did a bit of ombre stamping with Hydrangea and Ultraviolet Dye Inks. For the green bits, I used Green Field and Shadow Creek Dye Inks. For the background, I used the 36 Pan Watercolour Set to add a bit of loose watercolouring and tons of splatters. I also added Gold Glitter Tape for interest. To celebrate this release, Altenew is giving away a $50 gift certificate to 6 lucky winners! 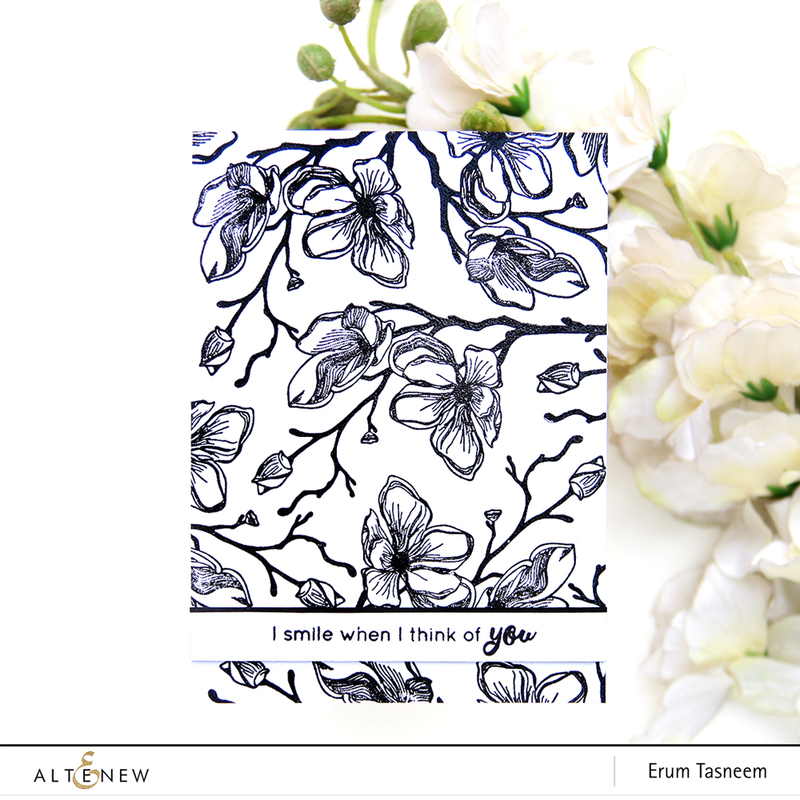 Please leave a comment on the Altenew Card Blog and/or Altenew Scrapbook Blog by 2/21/2019 for a chance to win. 6 winners will be announced on the Altenew blogs on 2/24/2019. A winner will be announced on my blog on 2/21 for a $30 gift certificate. That is all from my side today. Head over to Anna Komenda's blog. I have a new video for you guys!! 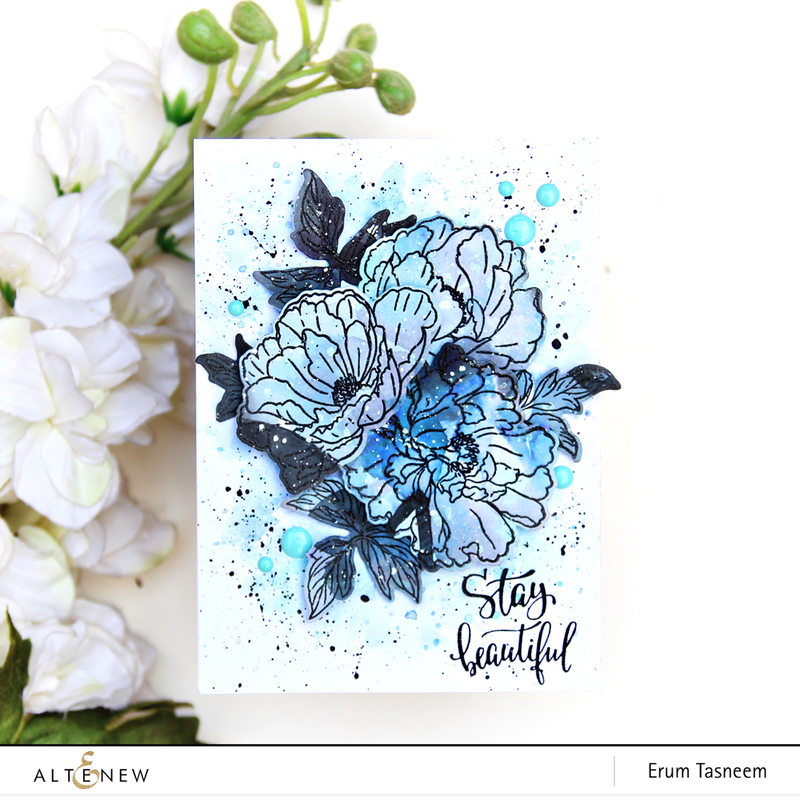 This one features some beautiful dies by Altenew! Hi there everyone! 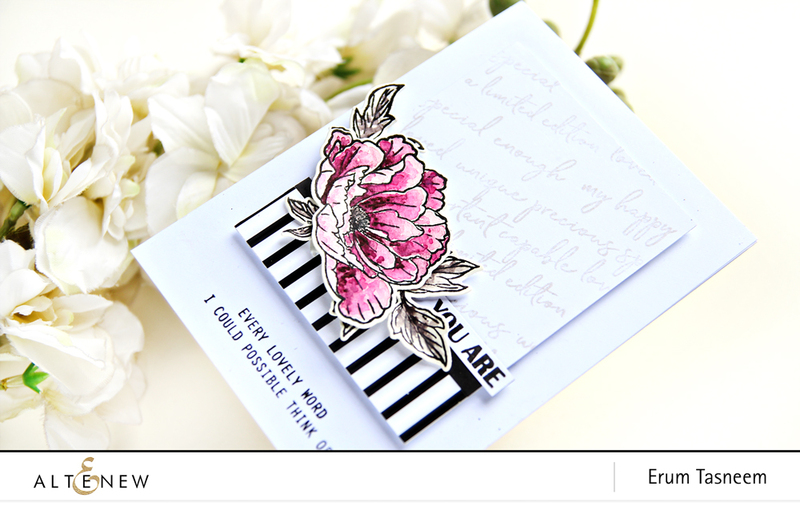 I have a new card to share today featuring the Embroidered Blossoms Stamp Set for their February challenge. So I stamped all the images on my one layer card in two different shades of the same colour family to get an ombre look. I kept adding images till I was happy with the look. To give my images a different look, I doodled "outlines" to my images. This gave the floral bouquet a more whimsical look. I also added gold crystals on some of the tiny flowers. In the end, I stamped the sentiment from Scripted Bold Sentiments 1. And added a grey shadow to all the images for faux dimension. I also added a few black paint splatters.